A specially formulated product that is designed to maintain a residual BAQUACIL Oxidizer level in pool water for clear water all season long. 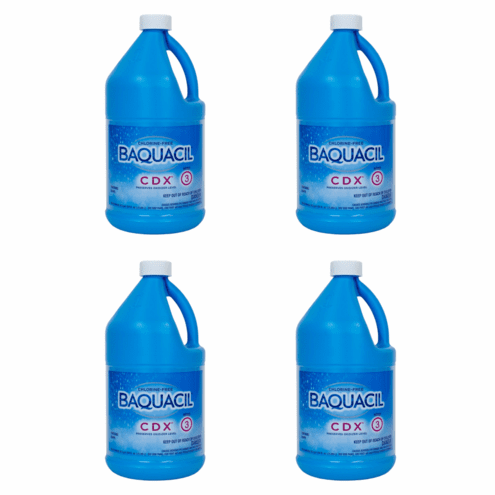 Step 3 in the 3-Step BAQUACIL CDX System. Start-Up: 16 fl oz per 10,000 gallons of water. Add 1 pint of this product per 10,000 gallons of pool water directly into the skimmer, ad pool opening. Add CDX immediately after the addition of Baquacil Oxidizer. Maintenance Dose: 16 fl oz per 10,000 gallons of water per week. Add 1 pint per 10,000 gallons of pool water directly into the skimmer. Add immediately after the addition of Baquacil Oxidizer. Do not mix products together. Allow 15 Minutes before swimming to ensure product is completely dispersed.